Arnold Schwarzenegger has Tweeted the first image from the set of his upcoming movie Maggie. 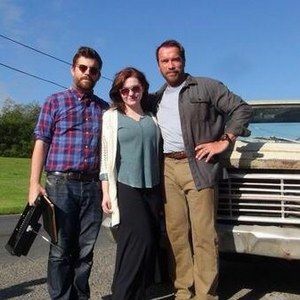 He stars alongside Abigail Breslin in this thriller about a farm family who must come to terms with a zombie virus that is quickly spreading across the country. The father must soon deal with his oldest daughter's infection, as she slowly becomes a member of the walking dead. Check out the action icon alongside his co-star and director Henry Hobson. "Really excited to start shooting Maggie today with our director @henryhobson and my fantastic co-star, @yoabbaabba."